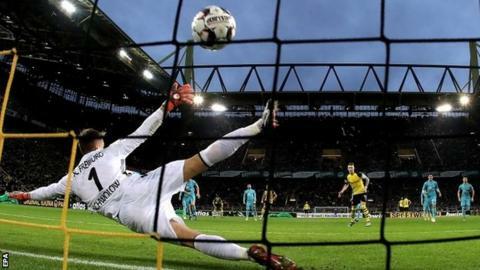 Borussia Dortmund maintained their unbeaten start to the Bundesliga season with victory over Freiburg to send them seven points clear at the top. Marco Reus slammed a penalty down the centre after England's Jadon Sancho was fouled by Dominique Heintz. Jerome Gondorf almost equalised with a 30-yard free-kick which hit the crossbar, and Dortmund's Lukasz Piszczek also struck the bar. Paco Alcacer then scored his 11th goal in 11 games to complete the victory. The summer signing from Barcelona is averaging a goal every 49 minutes, scoring on all six of his Bundesliga substitute appearances. Ten goals in his first eight Bundesliga matches is a joint record with Hamburg's Gert Dorfel in 1963. Elsewhere, Serge Gnabry scored twice as Bayern Munich beat Werder Bremen 2-1 - their first Bundesliga win since 27 October. Niko Kovac's side move up to third in the table - although Dortmund were the only side in the top four at the start of the weekend in action on Saturday. Match ends, Borussia Dortmund 2, Sport-Club Freiburg 0. Second Half ends, Borussia Dortmund 2, Sport-Club Freiburg 0. Goal! Borussia Dortmund 2, Sport-Club Freiburg 0. Paco Alcácer (Borussia Dortmund) right footed shot from the centre of the box to the centre of the goal. Assisted by Lukasz Piszczek. Attempt missed. Pascal Stenzel (Sport-Club Freiburg) right footed shot from outside the box is high and wide to the right following a set piece situation. Lukasz Piszczek (Borussia Dortmund) is shown the yellow card for a bad foul. Corner, Borussia Dortmund. Conceded by Gian-Luca Waldschmidt. Foul by Christian Günter (Sport-Club Freiburg). Axel Witsel (Borussia Dortmund) wins a free kick in the attacking half. Ömer Toprak (Borussia Dortmund) wins a free kick in the defensive half. Foul by Tim Kleindienst (Sport-Club Freiburg). Corner, Sport-Club Freiburg. Conceded by Jadon Sancho. Corner, Sport-Club Freiburg. Conceded by Achraf Hakimi. Substitution, Borussia Dortmund. Maximilian Philipp replaces Marco Reus. Lukasz Piszczek (Borussia Dortmund) hits the bar with a right footed shot from the right side of the box. Substitution, Sport-Club Freiburg. Tim Kleindienst replaces Jérôme Gondorf. Substitution, Sport-Club Freiburg. Lucas Höler replaces Nils Petersen. Delay in match Lukasz Piszczek (Borussia Dortmund) because of an injury. Substitution, Borussia Dortmund. Paco Alcácer replaces Mario Götze. Substitution, Sport-Club Freiburg. Yoric Ravet replaces Mike Frantz. Attempt missed. Axel Witsel (Borussia Dortmund) left footed shot from the left side of the box is high and wide to the left. Assisted by Marco Reus. Offside, Sport-Club Freiburg. Janik Haberer tries a through ball, but Mike Frantz is caught offside. Attempt saved. Marco Reus (Borussia Dortmund) right footed shot from the right side of the box is saved in the centre of the goal. Second Half begins Borussia Dortmund 1, Sport-Club Freiburg 0. First Half ends, Borussia Dortmund 1, Sport-Club Freiburg 0. Janik Haberer (Sport-Club Freiburg) is shown the yellow card for a bad foul.